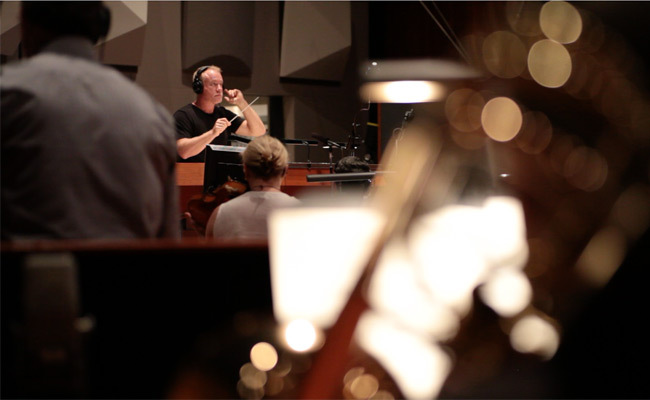 SCORE: A FILM MUSIC DOCUMENTARY is the first of its kind. What compelled you to tell this particular story? Matt Schrader: I have long been amazed by the power of music in film. It was always interesting to me how something without any lyrics could have such a profound meaning on us—arguably more meaningful than many songs with lyrics because it’s just the emotive power of the music. I remember waiting for this film to be made, and trying to find something that explored this power. There came a point then a couple years ago where I realized, “This is an exploration I would really like to go on,” and was lucky enough to have some friends who shared that vision. Making this film was the most challenging thing I’ve ever done, but also the most deeply fulfilling. SCORE dives deep into the artistic process of some of the world’s top film composers: John Williams, Danny Elfman, Hans Zimmer, and Alexandre Desplat, among others. How difficult was it for you to gain access? Are you just extremely charming? Matt Schrader: It was pretty tough for some interview subjects. There is a reason this film took two years to make! We wish we could’ve interviewed everyone all in one place, but with the average composer doing four or five projects every year, and often without much of a break in between, schedules were really difficult. And we learned that it wasn’t as easy as interviewing somebody on the weekend; most of these composers work right through the weekend, or purposely block off time to decompress and try to get in the creative zone. In the end, we were happy to get almost everyone we wanted in the film to craft a definitive look at the real innovators and geniuses who make film scores and soundtracks. Artistic process is a tough thing to get across on screen, but you do it so well. How did you and your team strategize about how to tell this story? Matt Schrader: Thank you! This is a film that centers a lot of its focus on the music, but how do we make that something visual? We didn’t want to do too many graphics or instructional displays that take us out of the moment, so we settled on telling the story from a very intimate point of view, allowing us to see different composers’ reactions and styles. Some of them are loud, some of them are melodic, some of them are abstract. But it was very important for us to be able to show just a little hint of how the composer got there. Can you give us a tease? What’s one of your favorite moments in the film? Matt Schrader: After Brian Tyler finished scoring on THE AVENGERS, we followed him to an AMC movie theater. It’s amazing to see how many people can be influenced by music and have no idea they’re sitting next to the artist. That’s really the amazing thing about film composers—they’re the musical and emotional geniuses of our age, and yet very few people ever recognize them. This is your feature debut, and I’m sure it’s hard to summarize all you’ve learned. Can you share one of your biggest lessons? Any advice for aspiring filmmakers? Matt Schrader: It’s kind of funny to think about, because our film is sort of an inside look at what makes film so powerful: music can say what words cannot. We learned it is invaluable to have a talented composer. We were lucky enough to meet a young composer named Ryan Taubert with a phenomenal grasp of musical language and unbelievable talent. We didn’t need much of our own original score, but he knocked it out of the park. He is on his way to bigger and better films already, but working with gifted people like that is a really rewarding thing as a filmmaker—and it makes the movie better. What would you like HIFF audiences to take away from SCORE? Matt Schrader: I think one of the most special joys in life is that feeling when you learn something new and interesting. Something that makes you go, “Wow, I had no idea.” I tried to structure the film around that feeling, so the viewer felt like they were on an enriching journey with these brilliant minds of the modern era. It was actually very important to me not to learn TOO much about the technical aspects of music, or music theory, because I wanted this to be an emotional experience, not an intellectual one. In the end, that helped SCORE really connect with the audience. We can’t wait for your World Premiere. What are you most looking forward to at HIFF 2016? Matt Schrader: One of the big goals I had early on was to explain how powerful music can give us goosebumps, and then still give people goosebumps with our film. We’re excited for people to experience the power and the awe of what great film scores can do to us—both in the theatre and for decades after. Check out the World Premiere of SCORE in the World Cinema Documentary section of HIFF 2016. Find tickets. Follow the film on Facebook and Twitter.